“By Coaches. 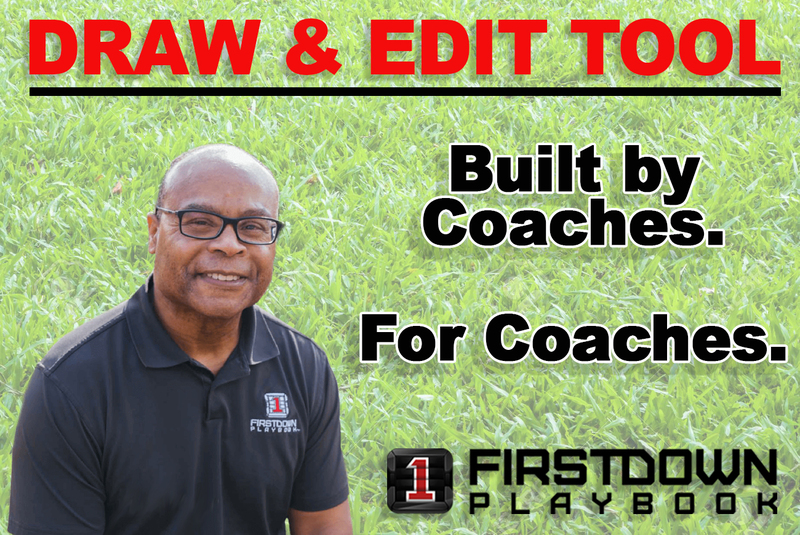 For Coaches” is a pretty cool way to say that the people providing your football coaching tools actually have coached the game of football and in the case of FirstDown PlayBook, we have coached it at a very high level. However, it goes much deeper than that when it comes to the new FirstDown PlayBook Draw and Edit Tool. You see, we have actually been that person who has to draw the plays, playbooks, installations, practice cards and whatever else, you name it! New flash. It’s hard and it’s time consuming. It’s time that you and your football staff could and should be spending with your players or getting ready for the time you are going to be spending with your players. There is a lot being made recently about how the New England Patriots young coaches all “pad games”. Most of these articles are written by folks who never broke down a game of football much less “padded” a game so consider your sources when you read this. Here’s the truth when it comes to you and your staff. You do not have the time to “pad” games or a single game for that matter. You teach class, have a family and countless other responsibilities. This is why anything that can help you present your players with professional looking material to learn from and it stills saves you time in the process is priceless. Today, we take you through one small feature of FirstDown PlayBook that changes your whole world as you are attempting to draw a run play play with the detail required to actually to teach your football players run blocking schemes.